Oracle Privileged Account Manager provides an easy to implement and versatile solution for managing high risk accounts. It lets you manage the password policies and the usage policies (e.g. time duration for which you can use the account) for the accounts. It leverages Identity Connector Framework to integrate with third party applications which are supported out of the box. It supports the break the glass facility where one person performs the tasks of another person in case the person is not available due to some emergency. One of the highlighting features is the ability of OPAM to provide comprehensive auditing and reporting of who has acted on a particular account at certain point in time as well as the real time data. It can be combined with Oracle BI Publisher to generate reports. Figure 1 shows the overall architecture of OPAM. There are two ways in which you can access the Oracle Privileged Account Manager features: Graphical User Interface (GUI) and Command Line Interface (CLI). The latter can be extended to invoke all CLI supported operations through Java API which is given this post. The GUI and CLI interact with the Oracle Privileged Account Manager Server over REST services. The OPAM Server is a component that handles password requests, generates passwords, and protects the password keystore. Figure 2 shows the GUI, CLI and other clients communicate with OPAM using the RESTful interface. 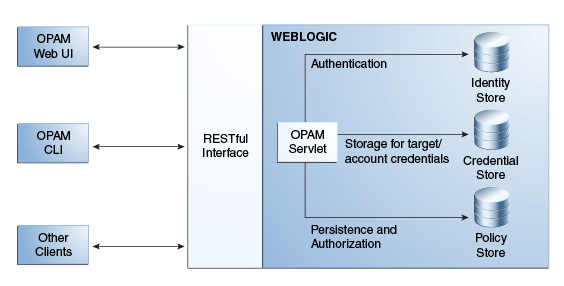 The authentication framework of the Oracle Privileged Account Manager leverages SAML based token authentication. It can be integrated with Oracle Access Manager Single Sign On. OPAM CLI Supports HTTP Basic Authentication over SSL to connect to OPAM Server. A target in OPAM is a system which contains users, and relies on users, system, or application accounts. You need to register the target system in order to manage the accounts associated with the target. Currently as of release 11.1.2.1.0 OPAM supports four types of pre-built targets. You can see the four supported targets in Figure 3. Generally adding a target involves providing the values of the host, port, domain and other minimum useful information required to retrieve the accounts from the target system. The two targets needs extra attention - The database target is supported for Oracle, MSSQL, MYSQL, DB2 and Sybase. Lockbox allows us to manage a specific target without configuring any connector. An account represents the privileged account on a target system. OPAM does not create or delete accounts on the target system; it only manages the existing accounts. When a new account is added in OPAM server, only a reference to that account gets created. Deletion of account from OPAM does not delete the account from the target. OPAM enables you to specify whether an account is shared or not shared. Shared accounts enable multiple users to use the account at the same time. Default (unshared) accounts can be used by only one user at a time. Below Figure 4 shows the database accounts containing the word sys in a database target. Grantees are users or groups that have been granted access to one or more privileged accounts. Users or groups are assigned to a privileged account in the Account tab. As you can see in Figure 5, user.0 is a grantee for the account DEVOAM_OPAM and there is no group specified. Administrators or end users can check out an account if they have been granted access to that account. When a user checks out an account, by providing a comment, it gets the access to the password of the account. The password is generated based on the Password Policy attached to the privileged account. On successful checking out, unshared accounts become unavailable for other users to check out until the account is checked in again by the user. Checking in of account resets the password of the account. In case of shared accounts, the password is reset only when all the users check in the account. Figure 6 shows that the accounts which are granted to the logged in user are checked in and ready to be checked out. The password policies capture the password construction rules enforced by a specific target on an associated privileged account. Every privileged account must have an associated password policy. OPAM provides Default Password Policy. However you can create custom password policies as per your requirements. The usage policies define when and how a privileged account can be used by a grantee. These are applied at the level of a grant. OPAM provides Default Usage Policy. However you can create custom usage policies as per your requirements. Connectors enable OPAM to interact with the third party target systems. OPAM leverages connectors that are compliant with the ICF standard. OPAM can use custom connectors to interact with the target systems other than the traditional LDAP, database and UNIX system. After the connector is developed and ready to be integrated with OPAM, the connector bundle needs to be put in a location where OPAM can access it at runtime. All the connector related configurations are stored in the file ORACLE_HOME/opam/config/opam-config.xml which schematically is governed by ORACLE_HOME/opam/config/opam-config.xsd. If you have made correct <connectorConfig> entries in opam-config.xml, you will see the new target in the Target dropdown after the server is restarted. Oracle Privileged Account Manager can be integrated with Oracle Identity Governance, Oracle Access Management and Oracle Directory Services – the three building tiers of Oracle Identity Management Suite. OPAM provides the ability to manually request access to accounts and to get approvals for requests in Oracle Identity Manager. OPAM can be protected by enabling Single Sign On using a Webgate agent in Oracle Access Manager. The Metadata information and passwords managed by OPAM are encrypted and persisted in the Oracle Database. It is recommended to leverage Oracle Database Vault and Transparent Data Encryption (TDE) for additional security. Oracle Privileged Account Manager is a complete product which has a comprehensive set of features that are required to manage the password lifecycle of privileged accounts – an activity for which there was no solution available earlier. OPAM delivers more value when used in conjunction with other Oracle Identity Management Products.